Every family affected by substance abuse or mental illness has experienced pain and confusion that’s disrupted relationships. Dynamic Family Services® at Family Recovery Resource Experts will help you develop new skills and behaviors to experience functional family dynamics that will support you during your lifelong journey in recovery. Dynamic Family Services helps your family craft its own “new normal” to nurture a healthy environment for lifelong family recovery. When your loved one gets some clean time under their belt, it can be tempting for everyone to let their guard down. With the healthier behaviors everyone has made during treatment and working through our Dynamic Family Services®, the functional household is a new environment for everyone. This is the time to work together to support your loved one and practice and apply the skills learned in treatment and therapy. If your loved one went to treatment, they likely received an “aftercare plan,” or “continuing care recommendation” to help them continue on their path to recovery. Certain aspects of the plan may require additional sacrifice or compromise from family members, like temporary living arrangements or attending 12-step meetings. Communication and an open mind are critical in avoiding new resentments and practicing ongoing recovery. Continuing to invest in your family’s recovery means you won’t lose the functional skills you’ve learned. Dynamic Family Services® can help you adapt to any situation and maintain a healthy family atmosphere, no matter what happens. It can be disheartening, even disappointing if a person relapses, but it does not have to mean returning to old behaviors in the family. FRrē’s Dynamic Family Strategists will support you as you navigate these difficult situations. Has a loved one completed treatment or gotten some clean time? 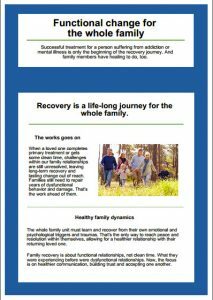 Download our free ebook “Functional Change for the Whole Family” for tips on continuing the healing process for the whole family—whether your loved one stays sober or not.